A Friday Night Parking Nightmare? Rarely are so many downtown events planned for the same evening: The Gen Con gaming convention, Blake Shelton concert, Motorcycles on Monument Circle for the Indianapolis GP and Fringe Fest all will draw folks downtown the evening of Aug. 17. Traffic could be heavy, and parking prices likely will rise to event rates rivaling those for Colts games. Headed downtown? Your options range from finding a metered space (free after 9 p.m.) to trying to snag a spot at Circle Centre (these will fill up early with Gen Con visitors). If you want to ensure you'll have a space, you can reserve a Bankers Life Fieldhouse VIP space at the Maryland Street garage for $22. (Click on the Aug. 17 Blake Shelton link and book your parking via an IndyParking.com partner.) 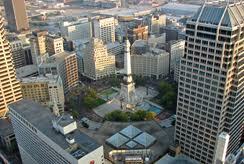 Also check out our Indianapolis Downtown Parking Tips.